The pool of genetic diversity in a domesticated crop like barley is much shallower than in the crop’s wild relatives. So researchers sometimes bring individual genes from a wild cousin into the crop to add crucial traits. But plant breeder Duane Falk is tackling the problem from the opposite direction: he is re-domesticating wild barley lines. In wild barley The pool of genetic diversity in a domesticated crop like barley is much shallower than in the crop’s wild relatives. With this novel approach, he hopes to enable barley breeders to access much more of the vast diversity occurring in wild barley. The mutation for a non-shattering rachis is thought to have occurred at least twice in barley’s domestication history. “Each one of those two major domestication events would have involved literally a single plant. And, as a self-pollinated species, that single plant would have been relatively homozygous [genetically uniform]. So, most of the variation that we have in our modern crop has occurred as mutations within those two original backgrounds. It’s easy to see why there is not much diversity in domesticated barley,” says Falk, who is a professor emeritus in Plant Agriculture at the University of Guelph. He led the barley and oat breeding programs at the university and has been breeding barley for more than 30 years. “Domesticated barley differs from wild barley in at least 10 major characteristics, but all of those characteristics occurred by selection after it was domesticated,” he notes. These characteristics include things like larger seed size, more uniform maturity, stronger straw, and loss of seed dormancy. 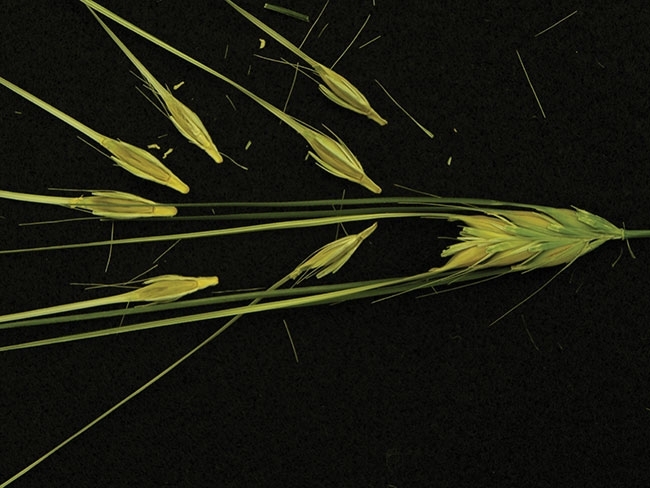 Modern breeding efforts have tended to narrow the diversity in cultivated barley even further. But a single gene for disease resistance is only a temporary fix because the disease organism needs only one mutation to overcome the plant’s resistance. Also, crosses with wild barley bring undesirable wild traits into the progeny, such as a shattering rachis, dormancy, weak straw and so on. So the progeny are troublesome to plant and harvest, and repeated backcrossing with the cultivated parent is needed to get rid of those unwanted traits. His idea is to move the non-shattering rachis gene into wild barley lines. The big advantage of this trait is that it allows a researcher to manage the breeding materials with standard equipment, planting them with a planter and harvesting them with a combine. “And as soon as we start handling the materials using current mechanical means, the characteristics that support the modern domesticated complex will be automatically selected for,” he explains. Falk’s first step was to contact his friend Dr. Brian Steffenson at the University of Minnesota, who has worked extensively with wild barley. He asked Steffenson to provide a set of wild barley lines that represent the full range of diversity in his collection. He made the initial crosses last fall in the growth room and grew the first generation (F1) over the winter. The first segregating generation (F2) is growing in the field now. Once the F2 plants mature, he will select the ones that don’t shatter. Then he’ll backcross those with their original wild parent. Falk is also planning to try using molecular markers for the non-shattering rachis gene. Using these markers would increase his costs, but it could make the selection process more efficient because he wouldn’t have to wait for the plants to mature to see whether or not they shatter. This would save time and space in the growth room and so reduce costs on that side. “The backcrossing work will likely take about four or five years. If everything goes well, I’ll end up with 14 derived lines that are almost identical to the 14 wild lines I started with except that they will have the non-shattering trait and probably the male sterility gene as well,” notes Falk. Once he has created the re-domesticated lines, Falk will make them available to breeders, geneticists and other researchers around the world. “They’ll be able to plant and harvest them normally and cross them easily. So re-domestication will make a very useful population out of something that right now is hard to handle,” he says. Crosses with these re-domesticated lines could lead to some pleasant surprises. Falk gives a couple of examples from his earlier breeding work when he made crosses with wild barley and then simply selected lines that he liked. “Wild barley is normally considered to have really small seed, and really poor, thin, weak straw. But some of the largest seed in barley that I have in my breeding program came from a cross with wild barley. And some of the strongest straw in my breeding lines came from crosses with wild barley,” he says. Since no one has tried re-domestication before, there’s no way to know how successful Falk’s project will be. “I’m taking three steps back and hoping that I can take at least one step forward,” he says. However, he is optimistic that this approach will work because the genetics of barley are relatively simple compared to a lot of other crops and because the male sterility gene will make crossing much easier.